God, in his creation, made the grass green, the sky blue and bananas yellow! 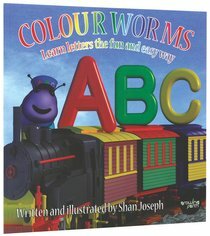 In Shan Joseph's uniquely illustrated books, preschoolers follow the adventures of a bunch of colourful worms and learn about the beautiful colours, numbers, and letters that fill God's world. Ages 1-4. [The delightful Colour worms are on to their next adventure in God's wonderful world - learning their ABCs! Join Al, Bella, Charlie and all the gang as they discover fun ways to identify and sound-out the letters of the alphabet. About "Colour Worms ABC (Colour Worms Series)"